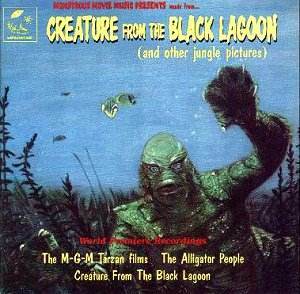 Following the marvellous albums Monstrous Movie Music and More Monstrous Movie Music, the label Monstrous Movie Music presents its third release, Creature From the Black Lagoon (and other jungle pictures). In one sense this is more of the same, which in this case is meant to be a compliment, the disc continuing the pattern established by the first two discs of remarkably authentic re-recordings of music from 1950's SF and fantasy B picture creature features, supported by a superb booklet which is a model of presentation. One difference this time is that all the films represented are jungle movies, and with six cues being taken from the MGM Tarzan series made between 1934-42, they are not all monster movies and do not all date from the post-war period. Robert Argon has provided the cover art for all three albums, and where Monstrous Movie Music looked frankly amateurish, and More Monstrous Movie Music rather more polished, the art and overall design here has taken a major step forward with a splendidly evocative painting of the titular Creature swimming in the titular Lagoon. The booklet is even better too. Where before David Schecter provided 32 pages of astonishingly detailed and informed notes, now, with sense of humour still intact he offers 40 pages and 21 000 words, which to put it in perspective is close to the word count of many a handbook. Schecter's enthusiasm for, and knowledge of old fantasy, science fiction and adventure films knows no limits, and combined with his entertaining prose makes these as informative as any film-related discs on the market. Be warned though, there is probably more information here than any other than the most obsessive fan could possible want to know. As for the music itself, it has been reconstructed and prepared by Kathleen Mayne with her usual attention to detail and nuance, splendidly performed with the Slovak Radio Symphony Orchestra using forces of comparable size to the studio orchestras of the time the scores were originally taped for the big screen, and recorded close-miked to capture a genuine cinematic sound packed full of detail amid that slightly dry, intensely dramatic sound of the Hollywood monster movie era. That said, the sound is here so authentic that it sometimes sound constricted, not like a modern recording, but as something which genuinely dates from the 1950's, minus the distortion, tape hiss and deterioration which several decades will inflict on the original masters. Which only leaves the music. The album begins with six brief cues from the M-G-M Tarzan films. They total just over 5 minutes, and show just how unimportant the studio felt music to be in the 30's and early 40's, the cues being compiled from the work of five different composers. This tiny amount of score was virtually all that appeared in the films in question, and while no one is going to claim this is great film music it is an attractive exercise in nostalgia for anyone who grew-up with these movies, whether on the big screen or on television. The main event is a 35-minute suite, of 23 cues, from Creature from the Black Lagoon (1954), the classic Jack Arnold creature feature which is easily the best 3D film ever made. This is different music to that available on Creature From The Black Lagoon on the Intrada label (MAF-7054D), and generously via the Monstrous Movie Music website David Schecter offers instructions how to combine the music from the two albums to make an almost complete Creature suite. The music is by a team of Dolan, Mancini, Rosen, Salter & Stein, and somehow despite the many hands retains a unified feel which today seems not so much evocative of any one film, but of an entire generation of B pictures. Snarling brass, lugubrious underwater figures, shimmering atmospheres, a gentle, sultry romanticism; it's all here in the quintessential sound of the 50's, a world a million miles from Miklós Rózsa and even Bernard Herrmann, but indelibly still an important part of cinema history. Again, no one would argue that this is great music, but it is highly effective film music and well deserves its place at the heart of this lovingly produced album. The surprise of the programme must come with the concluding suite, 16-minutes from Irving Gertz' score for The Alligator People (1959). The film seems to have vanished without trace (though page 29 of the booklet prints an hilarious still of a woman wrestling with a man in the world's least convincing alligator costume), but the music proves well worth rescuing. Scored for standard orchestra with the addition of a heavily reverberated electric violin, the music offers an alternative to the more familiar, and by the late 50's, very clichéd theremin for evoking the alien, the monstrous and the uncanny. A romantic, subtle and haunting score vastly superior to the film for which it was written, in the shadowy harp-led textures of such cues as 'Truth Serum' we are almost into Herrmann's Twilight Zone, and certainly there is a melancholy intensity which suggests that Irving Gertz talents, like so many other composers, were wasted on such mediocre fare. Coming soon, albums headlined by, respectively, Mighty Joe Young and This Island Earth. For the moment though, this is another most welcome addition to the MMM catalogue. This is music for the true fan and aficionado, a celebration of those neglected films which offer much more entertainment and fun than the A pictures which they sometimes accompanied, and which grabbed all the glory. No, it's not great music, but it is wonderful nostalgia, impeccably presented. No one will fail to be impressed by the extensive research conducted by the team from Monstrous Movie Music. The booklet which graces this CD is one of the best I've come across in quite some time, with comprehensive background information on each cue (including their sometimes unusual origins) and a breakdown of the role each piece plays in their respective films. Indeed, part of the fascination of the Creature from the Black Lagoon score in particular is discovering how many cues have been borrowed from previous productions and this is almost a history lesson in itself on how B features from the 50s were often musically assembled. And while it's all very interesting to be sure, in this day and age when film music is treated with far greater respect, it makes you realise what a long way we have thankfully come. The first few tracks on the CD are devoted to music used in a number of Tarzan movies starring Johnny Weissmuller, opening with a brief 'Fanfare' by David Snell and then segueing into some familiar sounding jungle drum work from Sol Levy in 'A Cannibal Carnival'. Ironically the 'Fanfare' was taken from the comedy Gold Rush Maisie (1940) and 'Cannibal' was actually composed in 1920 and made appearances in West of Zanzibar (1931), as well as becoming the Main Title of Trader Horn (also 1931). A perfect case of recycling it would seem. Of far more interest is 'In the Woodland' composed by Herbert Stothart, a very pastoral and classical sounding piece that was sadly ultimately unused when significant cuts were made to Tarzan Escapes (1936). Both Snell's 'Tarzan Montage' with more tribal rhythm and Daniele Amfitheatrof's 'End Title' are far too brief to merit much attention and the same can be said for 'New End Cast' also by Stothart, (originally from Waterloo Bridge (1940)). Finally the romantic, 'My Tender One' by William Axt concludes the Tarzan material, although this actually first appeared in the 1933 production Eskimo! The main body of the CD is dedicated to the soundtrack of Creature from the Black Lagoon (1954), kicking off with the 'Main Title' by Herman Stein. This piece is a dark, brooding affair and features an interesting subaquatic ambience that perfectly captures the atmosphere of this creature feature. It also introduces the three note blaring motif that figures prominently in various other cues, a simple device but memorable and effective and this is the key signature line of the entire score, even when other composers contribute like Henry Mancini on 'Monster Gets Mark, Part 1'. In fact, it's Mancini's work that registers most strongly, although some of his selections are admittedly taken from other productions. Such is the case with 'Monster Gets Mark, Part 2' where the most appealing section originates from East of Sumatra (1953) and that film also donates two other rather brief pieces in 'Duke's Little Helper' and 'Minyora's Plan'. It's interesting to note too that the titles of the cues refer to the story lines of the film they were originally written for, rather than anything that happens in 'Black Lagoon'! Even so there is some fine original Mancini work; the skilfully realised 'The Diver', the fleeting but compelling underwater atmospherics of 'Marine Life' and 'Monster Caught', all low-key suspense with uneasy tinkling piano. But while Mancini's music is probably the most inventive, Stein's is the backbone of the score and although he wrote quite a lot of work specifically for the film, even he was not above borrowing from his own previous outings. 'Tony Visits Port Royale, Part 1' for instance was written for City Beneath the Sea (1953) and 'End Cast' is a very short, soft romantic finale taken from The Redhead from Wyoming (1952). And it doesn't end there! Other productions to be plundered were Mr. Peabody and the Mermaid (1948) for the gentle, reflective 'Tale of the Mermaid' by Robert Emmett Dolan, while 'Salvage of the Lady Luck', the longest cue at over four minutes, also came from the aforementioned City Beneath the Sea, although this time written by Milton Rosen. That composer also contributes 'Henry's Trap' from The Glass Web (1953) and 'Clay Meets a Badman' from 1954's Ride Clear of Diablo starring Audie Murphy. Even Hans Salter lifts some of his own music from both Bend of the River (1952) and The Golden Horde (1951) in 'End Title', as well as incorporating Stein's by now familiar three note creature theme. As you can see, keeping up with all of these original sources is something of a nightmare!! Easier to define is Irving Gertz's score for another monster movie, The Alligator People (1959) and his 'Main Title' is a rather striking theme with a distinctly eerie quality, mainly conjured by the haunting sound of a electric violin (played by Terry Glenny). Other notable cues are 'Truth Serum', a very low-key, almost Herrmannesque piece, the brief but grandiose romanticism with a dark undercurrent of 'Shocker (Part II)' and the brass merging with that electric violin again in 'Alligator Head'. Tracks such as 'The Swamp', 'Cobalt Bomb' and 'Paul's Death, Part I' are less inventive though and are really nothing more than standard suspense music. A few bonus tracks are also included with Mancini's cue 'Unknown River' presented in its complete form (an edited version was used in Creature from the Black Lagoon). The difference however is really so slight that this will only be of interest to real connoisseurs. Far more telling are four tracks taken from The Alligator People where that imposing electric violin has been removed to allow the overshadowed orchestration beneath to be properly appreciated. Technically this is absolutely first-rate and the sheer amount of work, effort and attention to detail is to be admired and applauded. Undoubtedly there is an audience for this kind of nostalgic work (I grew up savouring titles like Creature from the Black Lagoon long before I actually saw the film itself) and as a long time fan of the genre I have a soft spot for a compilation like this. In saying that, to give a sense of balance I think it's fair to say that this will not necessarily have a wide appeal. It's very much of an era and fans of more modern film music may well find it somewhat dated. Even so, hard not to like and without doubt a real collector's item. Again I was amazed by the meticulous detailed attention lavished on this latest addition to the Schecter and Mayne monster film music series; and, once more, I was struck by how well the team had captured that special Universal sound in Creature from the Black Lagoon. I was also wondrously transported back to the Saturday morning cinema club days of my youth with those atmospheric Tarzan tracks; true they are brief and few but great fun probably because, rather than in spite of the fact that they sometimes sound Indian rather than African. And how scrumptiously creepy Gertz's Alligator People music sounds!